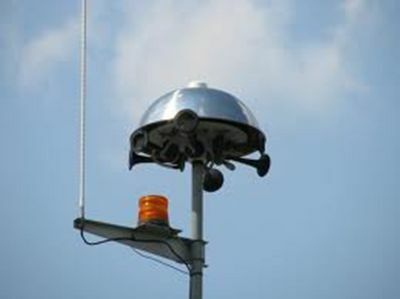 Thor Guard is a computerized system that can predict the probability of a lightning strike within 8-20 minutes before it will strike. The system is 97% accurate within a 2 – mile radius. When there is a potential for a lightning strike within the coverage area, a strobe light will turn on and a warning horn will sound with an uninterrupted 15-second blast. Immediately upon hearing or seeing these signals park users must leave and seek appropriate shelter. When the system senses conditions are safe, the strobe light will turn off and the horn will sound three short four-second blasts. Then normal activity may resume. The system operates 8 a.m. – 11 p.m. seven days per week March – November, excluding Sugar Creek Golf Course, where the system operates 7 a.m.-9 p.m. seven days per week March - November. Signal horns may not be at your site, but at a site within earshot. If you hear the alarm, please leave the park. If the weather appears to threatening and no alarm is heard, please leave the park. Lead by example. All adults should also leave the park. This system is designed to help you assess conditions. Neither the signal, nor the system is intended to guarantee that conditions are safe.